Seussical is a colourful whirlwind of a musical which takes the works of Dr. Suess and winds them into a magical, heartfelt story of acceptance and love. We follow JoJo, a Who with a larger than life imagination who, along with the rest of the Whos, live on a tiny speck of dust which is found by Horton the elephant. Horton vows to protest this speck with all his might which leads to a story of ups and downs and a whole host of characters. Aesthetically this is a beautiful production. 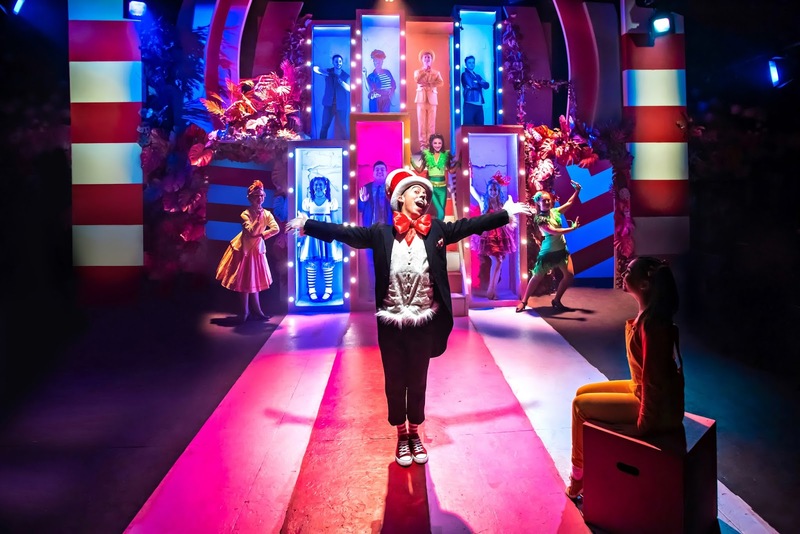 The pops of colour both in the set (Justin Williams and Jonny Rust) and the costumes (Rachel Cartlidge) really emphasise the story book feel and bring this wacky world to life in an over the top but never tacky, way. The costumes cleverly differentiate the characters without becoming cliched or predictable. Marc Pickering leads the cast sublimely as the Cat in the Hat. Absolutely commanding every inch of the stage he touches and demanding the audiences attention with every brow raise and smirk; he is utterly hysterical and clearly born to be seen. Amy Perry is sincere and relatable as Gertrude, Anna Barnes is suitably energetic as JoJo and Adam Dawson and Daisy Steere are outstanding as Mr and Mrs Mayor and they totter around the stage with humourous aplomb. 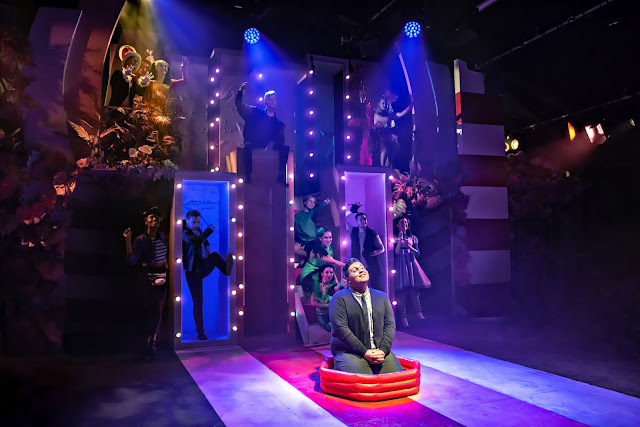 Scott Paige is endearing and vocally faultless as the lovable Horton and it's great to see him helming a show after standing out in Eugenius and The Addams Family. Paige brings a heart and warmth to this story that makes it the perfect show for a cold winter evening. The entire cast are enthusiastic and full of life from the get go; with tasteful audience interaction, energetic, sharp and fitting choreography (Chris Whittaker) and a boatload of originality, they make the production sleek and engaging. Captivating and innovative, Seussical is a musical for all the family that is sure to delight and enthral from start to finish. 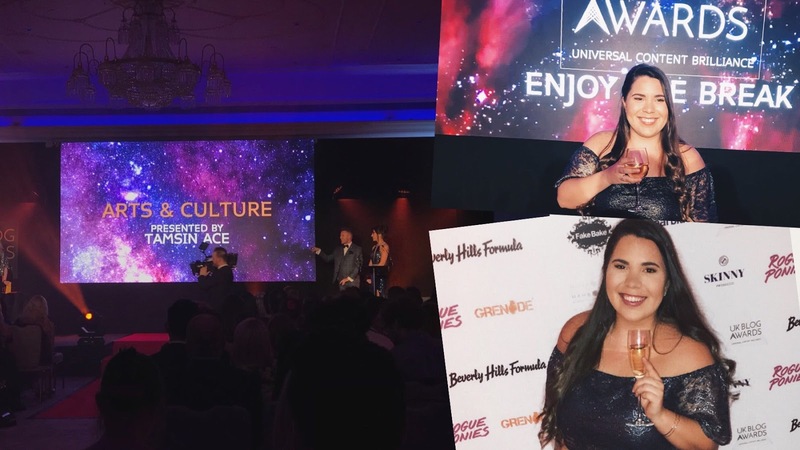 Presenting an over the top look at some crucial and relevant social issues, it's a show for everyone, that is extremely well thought out and will leave you feeling warm inside, with a smile so wide.